Online dating is getting more popular these days thanks to social media and the introduction of the internet into our lives. 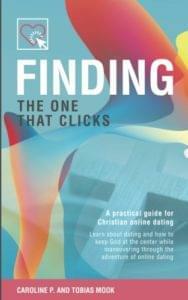 Can a Christian date online and still be in God’s will? We say you can! Sadly there are a lot of negative attitudes about online dating that cause singles to hide their profiles and date in secret. The enemy can use this secrecy to hurt us. God wants to be involved with every aspect of our lives and He will help us when dating online as well. So, let’s talk about it openly. What does God have to say about Christian online dating? How should we prepare to meet our life partner? Which websites are fitting and what should we put on our profile? Then what should we do if it doesn’t work out? Caroline and Tobias met using a Christian dating site. They made mistakes and learned a lot about the pitfalls of online dating. Now being married and leading Passion374, a parachurch ministry for Christian singles, they decided to put all they know about the subject into writing. Let their advice help you navigate and support you in this world of Christian online dating.